Cruise Passenger Hall, Level 2, Ocean Terminal, Harbour City, T.S.T. Swettenham Pier, 1A, Persiaran King Edward, 10300 Penang, Malaysia. 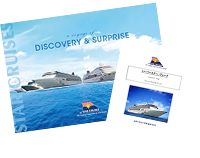 Copyright © 1998-2015 STAR CRUISES. All Rights Reserved.